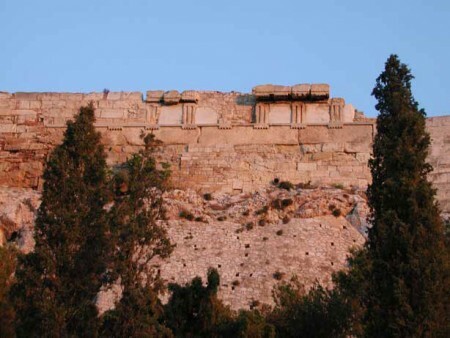 A part of the northern fortification wall of the Athens Acropolis will be restored after approval by the CAC. Photo Credit: Archaeology News Network. 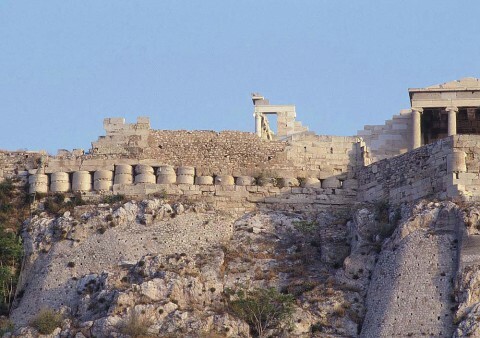 Sections of the recessed Athens Acropolis north fortification wall, known as the Themistoclean Wall, will be subjected to restoration works, following approval of the Central Archaeological Council of Greece (CAC). The Council decided last Tuesday that repair works in sections of the wall are necessary due to safety and structural reasons. A second plan, however, is still under scrutiny, since members of the CAC raised objections. The approved repair works at sections of the wall northeast of the north porch of the Erechtheum relate to architectural members of the ruined sanctuaries, the archaic temple and the pre-Parthenon, used as building material in the wall’s construction at the time of Themistocles. It was one of the first works to be carried out after the Persian War, using as building material marble blocks from the crepis of the destroyed pre-Parthenon, 26 half-finished unfluted marble column drums, poros column capitals from the “Archaios Naos” (Old Temple), and members of the entablature (architrave blocks, triglyphs, metopes and cornice blocks), which were all laid in a continuous row as crown blocks on the wall. Preserved today is most of the ancient construction, which has been partly filled in with rubble masonry, in recent repairs. Due to erosion and rusting, iron supports used in the 20th century are in need of restoration. Cement used later on to hold up eroded parts worsened the condition of the wall. The proposed intervention aims to restore this part of the wall and to ensure structural integrity including aesthetic improvements. Another proposal, however, regarding the west side of the northern wall, near the Propylaea, proved to be more controversial. It included the removal of a medieval section of the wall, built in the 15th century AD, and the addition of new material, aiming to reveal a part of the classical fortification. Only a part of this older fortification survives, though, as the exterior is destroyed to a depth of 1 or 2 metres. Dimitris Athanasoulis, head of the Cyclades Antiquities Ephorate, objected to the proposal, since he argued the process was irreversible and that the medieval section was also an antiquity. He added that there is no knowledge of how the original was built, which would lead to a new addition to the construction. 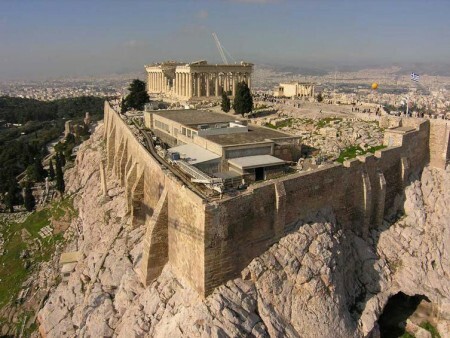 “Athens was one of the most important medieval cities in the world and there is nothing left. The only traces of it are in the walls. If we rip them up from there as well that would be a crime,” he said. Other suggestions called for the reconstruction of only the lower eight layers of the Classical-era wall that remain, leaving the Medieval one intact. The CAC’s resolution was that an on-the-spot inspection of the site should be carried out by its members and the matter will be re-examined, after consultation of the Byzantine and Post-Byzantine Antiquities services and agencies.